The Remo Apex Djembe ushers in a new generation in drumming with this new, sleek looking djembe. 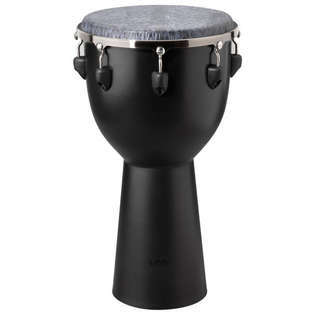 The Remo Apex Djembe is designed with unparalleled sound quality and playing comfort. It is light weight and features an elegant plated steel radius counterhoop that feels great from the first beat. The specially engineered tuning brackets boast inverted, recessed tuning hooks that easily tune the drum. The Apex Djembe will perform to your highest expectations for all levels of drumming. The Remo Apex Djembe's synthetic Skyndeep Black Goat Stripe graphic drumhead screams volumes for any drumming activity and will stay in tune in all weather. The Skyndeep drumhead features a small removable Sound Control foam dot under the drumhead. This feature produces less overtones for a more focused and dryer animal-like bass tone with rich slap tones. The Apex Djembe is manufactured using a traditional carved djembe design and molded from ABS durable plastic materials that are good for impact resistance. i just got this today and i love it. It has a more wet slap and bass tones compared to other remo 12" djembes giving it a crisp tone. The bass tone is much better compared to the smaller advent djembe.